I’m sure I say this for every blog post surrounding launches, but I’m SO excited to talk about my most recent project! 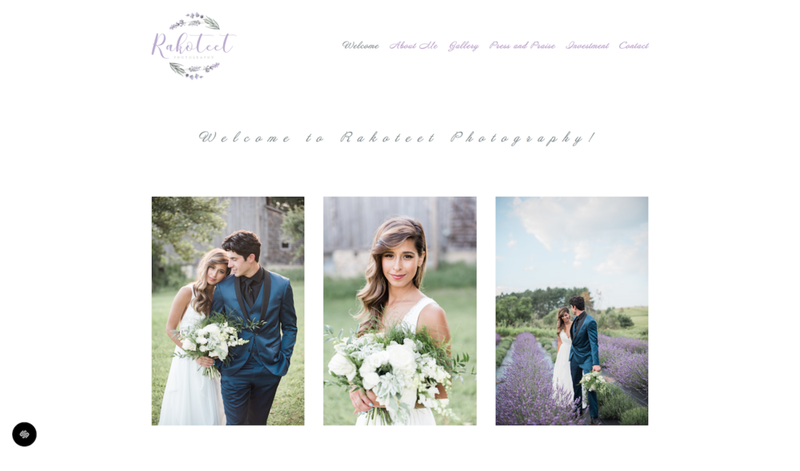 I teamed up with Michelle at Rakoteet Photography to bring her dream website to life. Michelle is an amazing wedding photographer who had DIY-ed her site. She knew that in order to increase the investment of her packages, she needed a website that was going to attract the right clients. When it came to website design, she was overwhelmed and unsure how to give it the perfect facelift. She had a list of sites that she loved, but didn't feel equipped to make those changes herself. Michelle first filled out a questionnaire so I could learn more about her photography business, her site goals, and the emotions she wanted the website to evoke, among other questions. From there, she put together a brand inspiration board on Pinterest. When Michelle came to me, she only had a logo and two brand colors - purple and grey. Therefore, we worked together to create the perfect color palette that not only represented Michelle and her brand, but also appealed to her ideal clients. I first started with the wire frames for each page so Michelle could envision the general layout of the website. We made minor changes to the layout of the galleries, but then it was time to move on to the fun part…the actual design of the site. I start off with only designing the homepage so that the client gets a feel for how the rest of the site will look. 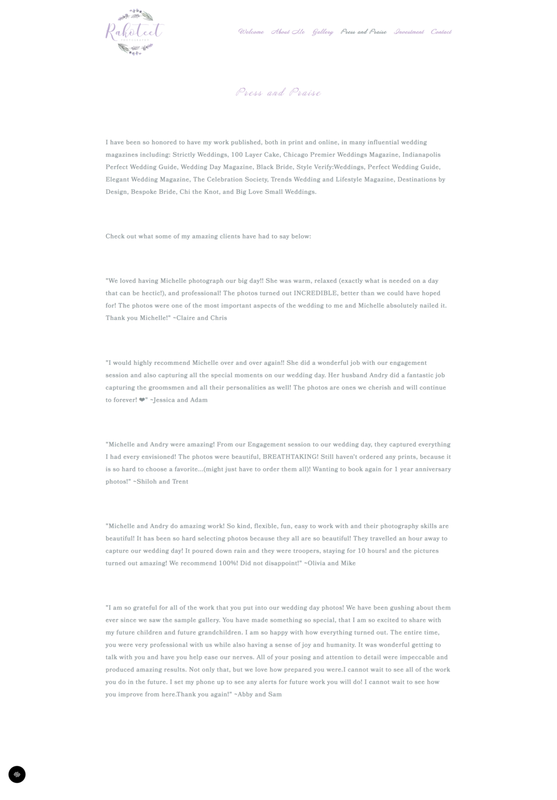 After a few changes to the homepage, I designed the other pages. I created most of the website graphics in Canva and designed a few favicon options to finish off her site. Time for some before and after photos! Michelle had two revisions for the full website, where we made small changes to color choices on the site and where different images were placed. After the design process, I made sure the site was SEO friendly by adding a site description, page descriptions, and keywords to the title tag. I also ensured that all elements of the website looked perfect on mobile and desktop. At the end of the project, Michelle LOVED her new design. I was hesitant at first to spend the money to hire a designer, but I'm SO glad that I hired Lauren! She is absolutely amazing, and I cannot recommend her highly enough! 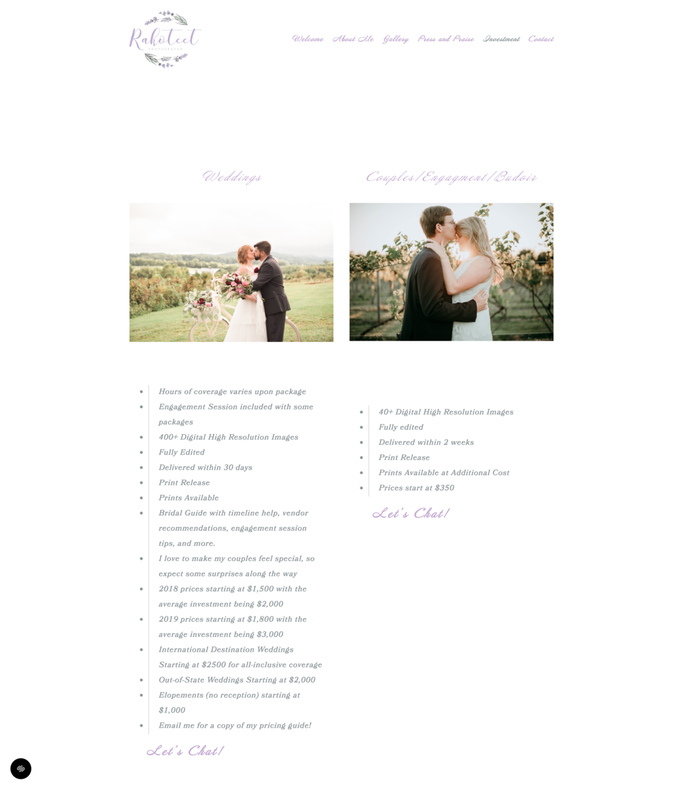 She made the entire process so easy, and her content planners were SO helpful! I LOVE the end product of how my website turned out! My new site is WAY better than anything I could have done myself, and targets my ideal client so much better. I highly recommend Lauren for branding and website design! Once the site was completed, we jumped on an hour-long Skype call where I transitioned the site ownership to Michelle and helped her create and connect a branded Google Suite account. We also connected her existing domain to the new site and her social media profiles. We then walked through each page of the site and the design details. Are you looking for a website redesign like Michelle? I’d love to connect! Click the link below to view my packages and set up your free 15 minute consultation!